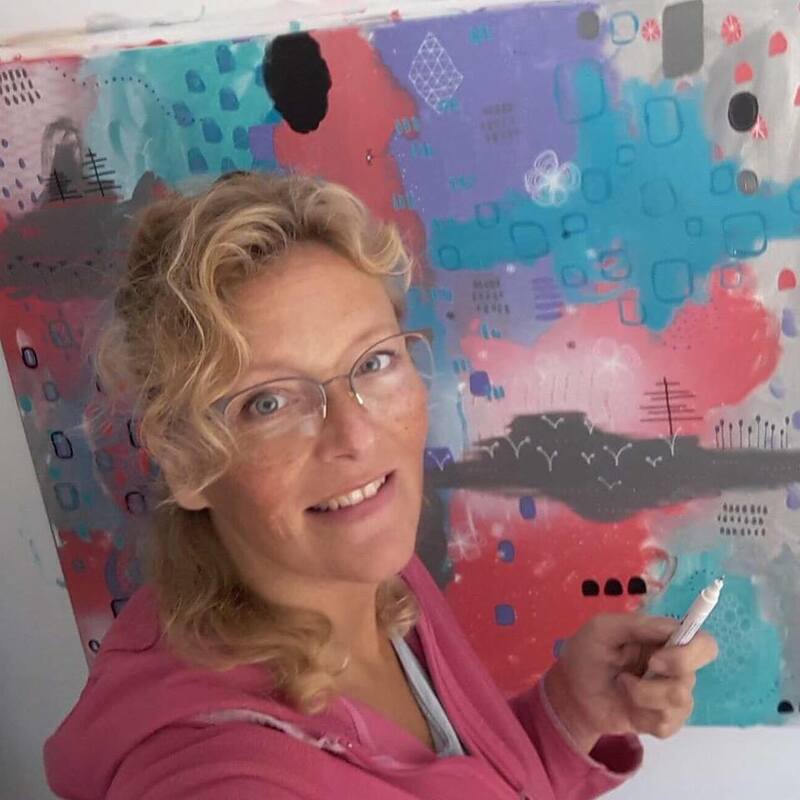 I'm Mariëlle, artist, wife and mother of a son and daughter. my husband and I live on the urbanisation La Marina, San Fulgencio, Spain since the summer of 2017 and I use a bedroom in our house as my studio. In daily life I work at a real estate agency in the village where we live. Our family has been moving around quite a bit over the years, ever since our children were at a very young age. We are all originally Dutch, but have lived in The Netherlands, Spain, Sweden and now my husband and I have returned to Spain again together. Our daughter is still living in Sweden and our son is studying in The Netherlands. Art has indirectly always been a part of my life since my father was an artist. I have always loved sketching, handcrafting in many ways, been interested in gardening and most of all had a big interest in interiordesigning and decorating houses. Since we moved so many times and because every single house has had to be renovated and decorated, I had many opportunities to work creatively in my own environment. In 2014 something changed, my father passed away. It was a big loss for me and my family. I am an introvert person and thought by thinking a lot and remembering I could give my grief a place. But as time passed I felt that I did not have processed my grief, far from that. I inherited my fathers acrylic paints, his easel, sketchbooks and some of his paintings. I noticed I was feeling better when I was around his things, working with them and more and more I felt I needed to start painting myself. Finally in Spring 2016, I picked up a brush and since that day I have never stopped. That experience of painting, feeling calmer and more in harmony with myself, connected to my father, made me process my grief and learned me to enjoy the freedom painting can give. For me it is like telling a story, my story, painting my emotions. I am a positive thinking person and I am drawn to happy colors, as I like to call them. You could say that "lots of color" is my signature. At this moment we have renovated our house in Spain and a few months ago we moved into our first finished house and are now renovating the second house on our plot. As soon as that is finished we will move in there and we will turn the house where we live now into my studio. In my new studio I will be giving intuitive painting workshops starting from end of May '19. I will also be able to offer rooms for people participating in one of my workshops. So you can enjoy our newly renovated rooms and our pool. ​Feel welcome to join me or contact me! Here is my Instagram feed, in case you are getting curious!